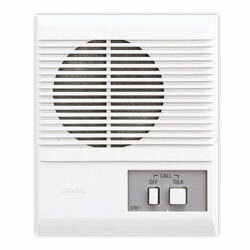 The LEM System is a compact, basic yet very efficient Open Voice intercom system. A master station with one or up to three remote stations can be used for simple communication between locations or for monitoring remote areas. Various applications include hospitals, clinics, schools, daycare centers, correctional and law enforcement offices, plus many others. The LEM-1 is a single call master unit that can sit on a desk or be wall mounted. 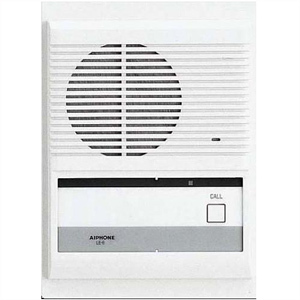 It is usually located where power is available and where it is desired to be able to audibly call the slave unit and have the remote person be able to communicate to you hands-free. If the Master Operator desires to speak with the remote person, he simply turns the unit on by pressing the "Talk" button and continues to hold the button while he is speaking. When he releases the button he can now hear the remote or slave unit. If the person at the slave unit desires to speak to the Master, he presses the "Call" button which will produce a tone at the Master which will get the attention of the Master Operator at which time he presses the "Talk" button and communicates with the remote. When the conversation is complete, the "Off" button is pressed and the master unit will be silent. A choice between a 1-call master (LEM-1) or a 3-call master (LEM-3) is allowed, while 4 different door or room substations can be connected. The system is easy to install, since all one needs is a pair of wires between master and sub station(s). The master station is powered through a 6V DC power supply.